Institute manager Kevin Deery was over the moon after his side thoroughly deserved to defeat Ballyclare Comrades, on Saturday. Deery felt the Waterside men should have won by a bigger margin and was full of praise for the character and commitment they showed to dig out the 4-2 win at Dixon Park. 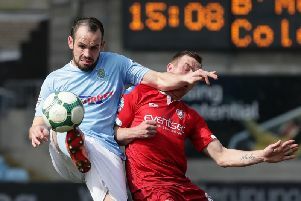 Institute went into the tie with a number of players struggling or missing; Stephen Curry and Jamie McIntyre were under the weather but Coleraine target Ciaron Harkin missed out completely, as all three had flu like symptoms. However despite the sickness in the camp it was the visitors who took the tie to the home side. “Look see when you are brave our fortune normally goes for you,” he stated. “See if you put yourself through something that you think you aren’t capable off it usually works out for you, but I felt we probably should have won five or six and that’s being nice to be honest. “We had some outstanding opprtunities but I’m just delighted because I know they are capable of that in the final third, but we saw good quality and could have scored more goals. “Stephen (Curry) had two great opportunties in the first half and he was a wee bit disappointed, but he did say at half-time that he would get another one, so he stuck to his word. “Then as a manager you aren’t going to take him out of the game because he’s on a hat-trick, but he put his hand up and said he’s done because of his illness and that’s very good responsibility he showed. Deery admitted that a wee pep talk a few weeks ago seemed to do the trick. “We were really disappointed last year that we fell at the first hurdle, but this season I spoke to the players a few weeks back before the draw and telling them it would be nice to do well in the Irish Cup. Striker Sammy Morrow had a superb debut, although he wasn’t on the score-sheet, his hold up and link up play was a major reason why Stute breezed into the sixth round and his clever black flick to set up Michael McCrudden for the fourth capped off a fine display. “We felt Sammy could definitely bring something to the table for us and what made up my mind was after the NW Senior Cup Final, where he played up front, his attitude and application was spot-on,” he added.